The Gardens Between was shown for the first time at the PlayStation Experience 2017 expo. The upcoming PlayStation 4 title is being developed by Train Conductor developer The Voxel Agents. We managed to get some hands-on time with the upcoming puzzle game while at the show, and came away intrigued. Controls are deceptively simple in The Gardens Between. The player watches two characters, Arina and Frendt, as they circle around an island. Other than interacting with items, the characters are not controlled directly. Rather, time itself is controlled using the left analog stick. Puzzles consist of managing energy that Arina can carry in a special lantern, or altering the state of things in subtle ways in the past, to affect the future. The islands might end up being an important part of the story, though just how much remains to be seen. They are fairly small in size, but the islands are littered with random pieces of older technology, blown up to gigantic size relative to the characters walking around them. It’s an intriguing aesthetic, and many gamers will have bouts of nostalgia as things such as old tube televisions, VCRs, and related “ancient” technology and toys are discovered and played with. One puzzle shown involved having Arina’s lantern jump into the side of a tube TV and into a Mario-like game. Controlling time also controlled the game, and the goal was to ensure that the lantern would pick up the energy, then bounce back out in reverse time with the energy still attached to it. The puzzles shown during the PSX demo weren’t particularly hard, but then this game isn’t focused on making you scratch your head too much. Co-founder of The Voxel Agents Simon Joslin said that they are aiming to create a meditative experience, one where a relationship between two lifelong friends is told bit by bit. The game is also not going to be very long – a couple hours at most. So it sounds like The Gardens Between won’t overstay its welcome, though hopefully there will be some bonus/extra challenging puzzles for those looking for a mind bender. Speaking of meditation, the soundtrack for The Gardens Between sounded very zen-inducing, indeed. It had a laid-back vibe, one with soft synths, light piano, and a slower tempo. This really set the mood that although The Gardens Between is a surreal experience, there was definitely going to be some drama and an emotional element to the whole thing. The characters never spoke, but their body language said plenty. Arina would occasionally run up ahead of Frendt, and then wait impatiently, arms crossed, until they were together again. Smaller gestures indicated their closeness, such as holding hands near the top of an island, and always setting the lantern in the level-ending pedestal together. 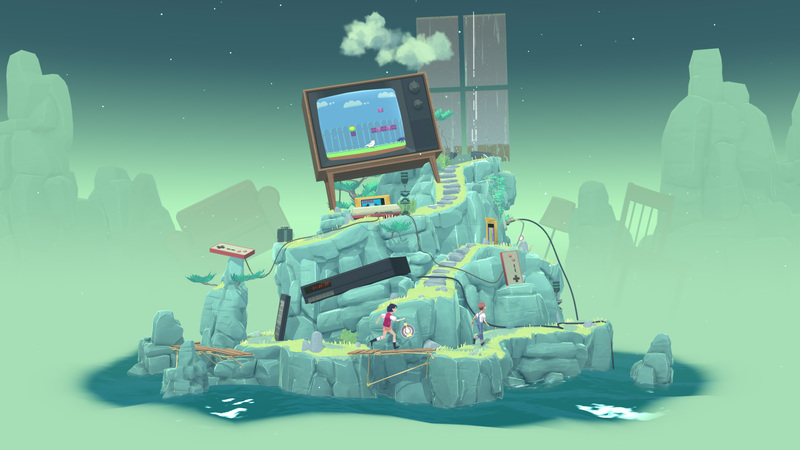 The Gardens Between is shaping up to be a nice venture outside the typical realm of puzzle games. Controlling time can lend itself to some ingenious puzzle design, as Braid can attest to. It will be interesting to see just how clever The Voxel Agents get with the tools at their disposal for The Gardens Between when the game launches in the third quarter of 2018. The Gardens Between preview conducted at PlayStation Experience 2017.